LGBT wedding and honeymoon guide: Kauai. Opens in a new window. Christmas in Kauai. Opens in a new window. Solo travel on Kauai. Opens in a new window. Addicted to Kauai. Opens in a new window. Favorite eats on Kauai. Opens in a new window. This property is for those that like a condo setting. We were able to cook in the apartment and had plenty of room for all our belongings. We felt at home there for our 2 week stay. If you are looking for a big name resort, this is not it. If you are looking for something that feels like home, this is it. The staff was very accommodating and the common areas are very well kept. Where to find Kauai hotels near an airport? 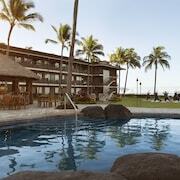 How can I find hotels in different Kauai neighborhoods? Where can I find hotels in Kauai that are near tourist attractions? Kauai is Hawaiian gem. Situated in America’s most tropical island chain, this peaceful island boasts lush scenery, jade-fringed waters, and an unforgettable sense of remoteness. This is, after all, is a rural destination at heart, and the top hotels in Kauai Island let you bask in the serene atmosphere with all the benefits of big-city amenities. Can’t wait to choose your favourite spot? Expedia.ca is here to help. 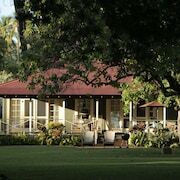 The best hotels in Kauai Island are scattered throughout several small towns, and it can be tough to choose between so many versions of paradise. If you’re searching for an unbeatable place to try your hand at surfing, diving, and snorkeling, try one of the Kauai Island hotels near Poipe. This coastal village offers gorgeous beaches, luxurious accommodations, and some of the area’s best water sports opportunities. 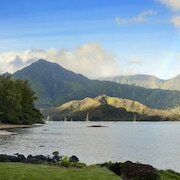 Hanalei Bay is a similarly adventurous spot, and you’ll be close to spectacular mountains and waterfalls. No matter where you go in these areas, you’ll never run out of things to do. 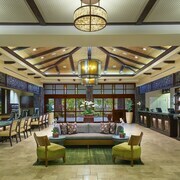 For something a touch more bustling, check out the hotels in Kauai Island locations like Kapaa. This town is the island’s largest, but it still retains the laid-back charm of more remote destinations. Plus, because so many commercial centres are located here, you’ll find an array of Kauai Island hotel deals in the most stunning areas. Ready to book your Kauai Island vacations? We’ll make it simple for you. Just tell us when you’d like to travel, and we’ll help you find the cheapest flights and latest rental car deals. 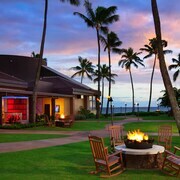 That way, you can purchase all the extras at the same time you reserve the best Kauai Island hotel Hawaii has to offer. From remote retreats to village resorts, our selection of trip essentials is sure to please every type of tourist. 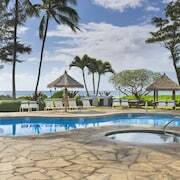 What are the most popular Kauai hotels? Are there hotels in other cities near Kauai? 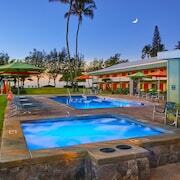 What other types of accommodations are available in Kauai? Explore Kauai with Expedia.ca’s Travel Guides to find the best flights, cars, holiday packages and more!